Listen up. It's time for the fifth sense in The Five Cycling Senses Series - Sound. Just as in the Smell post, we'll dance happily over the noise that motorized traffic produces by sticking our fingers in our ears and singing, "Lalala, I can't hear the cars!". Bikes, by the nature of their design, are often quite silent as they roll through town. When you ride with so many other cyclists in Copenhagen, however, your ears are tuned to the sound - or non-sound - of other bikes. Your hearing adapts, dog-like, to the noise of a bike coming up from behind, even next to three lanes of cars. In the photo above, I'll bet the cyclists all know - even if sub-consciously - how many other cyclists are around them. A recent visitor commented that the cyclists on the bike lanes don't shoulder check when overtaking. I told him to look more carefully and then he started noticing the subtle, quick head movement which seemed to confirm what the ears already knew. That the coast was clear for overtaking. 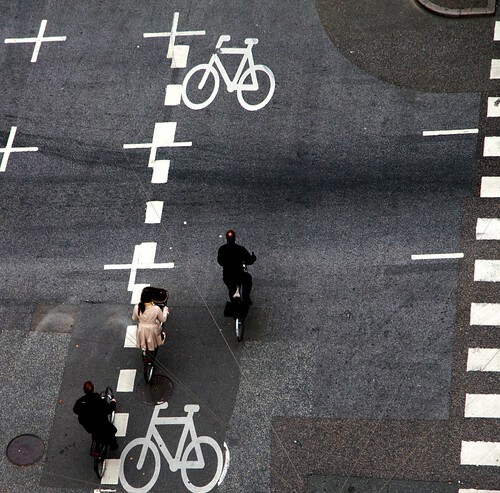 The soundtrack of urban cycling is composed by the city in which you ride. Personally, I love this symphony of cityness. Wifealiciousness and I, after a spell in the country, always remark how it's nice to be back in the city again. Not that we don't enjoy the country - one great thing is that you can hear your bike on the lanes or swishing through grass, with all the lovely creaks and squeaks. It's just nice to get back to The Big Smoke. The Five Cycling Senses - Sound from Colville Andersen on Vimeo. I whipped up this little film wherein I explore six or so sounds relating to bikes in Copenhagen. You'll just hear the sounds at first and then afterwards you'll see the clip with the related sound. You can stop in the middle and guess if you want. One of the few bicycle sounds that irritates me is the sound of gears. The odd Copenhagener with a multi-geared bike may, when accelerating off the light, hop past 5 or 10 or 22 gears to get to the one they want. This dreadful clickclickclickclickclick is the cyclo-equivilant of grinding the clutch. Fortunately, it's rare. You'll often just hear that one little click when someone gears up. Actually, one of the aspects of Copenhagen bike culture is the complete disregard for gearing up or down. A friend of mine from Norway brought it to my attention. He noticed that most cyclists don't even bother with it and prefer starting in a heavy gear off the lights, even though it requires more muscle-power. 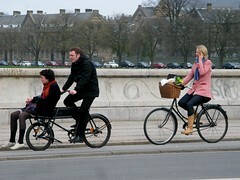 The sounds of cycling in Copenhagen include the obvious sound of human voices. Chatting with your friend or loved one as you ride. 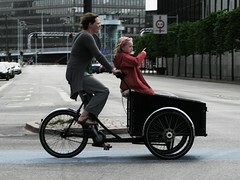 Side by side or on a cargo bike. Nothing beats the human voice engaged in a conversation while cycling. Even if it's a quick mobile phone chat. 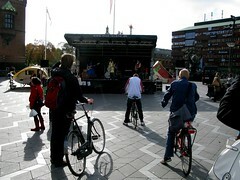 Music can also be enjoyed on a bike. In this case, a concert on the City Hall Square. One of my readers has asked me to continue with the senses and to include sixth sense and the lesser known "kinesthetic sense, balance and thermoception". Oh boy. I'll give it a shot! A little addendum to the Smell post and the mention of perfume/shampoo. A reader posted this link in the comments. A group of students in California are pushing for a ban on fragrances in public spaces. I love it when I overtake or cycle behind someone who is singing or humming to themselves. I also love when I ride by Tivoli and hear all the happy screams from the rollercoaster and other rides. wow. different species of bike!!! My bike has theoretically 27 gears, but in practice I use only 14. I have to use this kind of bike to spare my knees and I really enjoy it. May I ask what you filmed with? It's got a pretty good mic on it. I almost never hear people talking as they're riding (usually people here are in too much of a hurry), which is a shame... but when I do, it's wonderful. I love talking with my wife as we ride around town. One sound that has become familiar to me is the sound of pedal clips... which seems extremely laborious and inconvenient for riding in a city - having to unclip and re-clip every time you stop at a light or a stop sign... but people do it, for whatever reason. I think this is also a great motivation for people to not stop at lights and stop signs (so they don't have to bother with the pedals). Anyway, I also love riding through areas where there are a lot of pedestrians, and hearing the noise of people walking around, talking, clanking dishes from bars and restaurants, etc - the sound of people just being people. Actually, that reminds me of one of my favorite things about cycling home in the evenings - again going through the neighborhoods, which seem to inevitably be completely silent around 5.30pm - it's so nice to ride in silence and just hear the noise of natural things instead of cars or machinery or trains or whatever else you often hear in the city. For a couple of years I lived in a house at the bottom of a hill in Mount Rainier, Maryland (just over the northeast boundary of Washington DC). I would continuously hear cars roaring up and down the hill, but occasionally there would be the soft clicking whirr of a bike going by as it came down the hill, to delight my ears. I usually commute early in the morning and there are rarely any cars on the road. Something I noticed a while ago is the audible click when traffic lights change. Something that a person in a car would be completely oblivious to. Also, I am surprised that bells have not been mentioned yet. Bike bells, church bells, even wind chimes strung up on some distant porch. Tony... The film clips are a combination of my Canon G9 and my Sony HD HDR-HC5 Handycam. The shot with the spires at the end of cyclists in rush hour is the Sony... great mic. But the G9's film capabilities are quite exceptional, too. Lovely to read about sounds I don't hear over here. Pedal clips, and a Kickbike [cool addition!]. Regarding iPods... they are great for putting a soundtrack on your city. I prefer Preisner when I choose to wear my iPod. Emergency vehicles are very audible here, so no problem. What of motorists who play their radio too loud? Far more dangerous. Bike bells WERE mentioned... they're in the film I made. Church bells are a good addition to the list, though, and appropriate here in Copenhagen. We have many churches from back when people actually went to them. Bought my bicycle bell in Amsterdam. If I ever should get back to Copenhagen, I'll surely pick up a basket or some other bicycle souvenir there. I'm thinking how dark it must be getting in Copenhagen now, when people are commuting. Guess it is a lot easier to get out there when there are so many other cyclists. I think regarding wearing headphones for riding - where you are riding makes a big difference... Here in Portland, I'm mostly riding in traffic on the same roads that cars are riding on, so it would be much more dangerous for me to wear headphones while riding than in Amsterdam or Copenhagen, where bike traffic is totally removed from car traffic. Cycle Chick: I used to sing while racing. I wasn't necessarily doing it to myself either. I'll sing anytime, anywhere I won't actually get assaulted for it. It gives me the giggles when people complain about musicals because "You don't see real people just walking down the street suddenly bursting into song, do you?" They don't know me very well. Although sometimes I just play a penny whistle instead, but not while riding . . . often. M.O. : My favorite composer is Anon. Go figure. But Bach and Vivaldi will do. Anon: My bike has two fenders, two caliper brakes, two panniers on the rear rack; but one wicker basket on the front and . . . one fixed gear on the back. This allows me to hear the frogs sing as I bicycle my violin home 49k through the country after midnight. What iPod could give me a better soundtrack than that? Even the Ode to Joy cannot compete with the real thing. I love to ride my bike whilst listening to my ipod. And luckily I don't ride very fast and I live in Copenhagen and ride on the lanes and I don't concieve it as dangerous at all. I have biked with music in my ears every day for the last 12 years and I have never been in a dangerous situation. As Zakka wrote, the emergency vehicles are very loud and I have no trouble hearing them. And then I use my eyes. I love to hear the sounds of houses in Prague. There are places like a musical school when most often, when you are on that corner, you can hear somebody play the piano. When you pass a restaurant, you hear the people chatting, the sound of forks and knives. You can often hear the church bell ding-danging or even playing a song. Our concert hall next to the river always has some little music on the outside speakers as well. The sound of water is important for a city on a river. As for listening to digital music players, I think it actually quite often trains people who need to ride in heavy traffic safer, because it's a very strong imperative that we always say to all fellow cyclists not to rely on the sound for serious things. Some cars, in some situations, even big ones, you don't hear them. Forcing somebody to rely more on his sight than hearing is a healthy thing for his safety. As the mornings and evenings are getting darker these days, I'm finding myself more and more familiar with the hum/buzz of the bottle generator against my front tire. Not always my favorite sound, but at least it's one that means I can see where I'm going, and be seen by cars and other bikes coming my way.